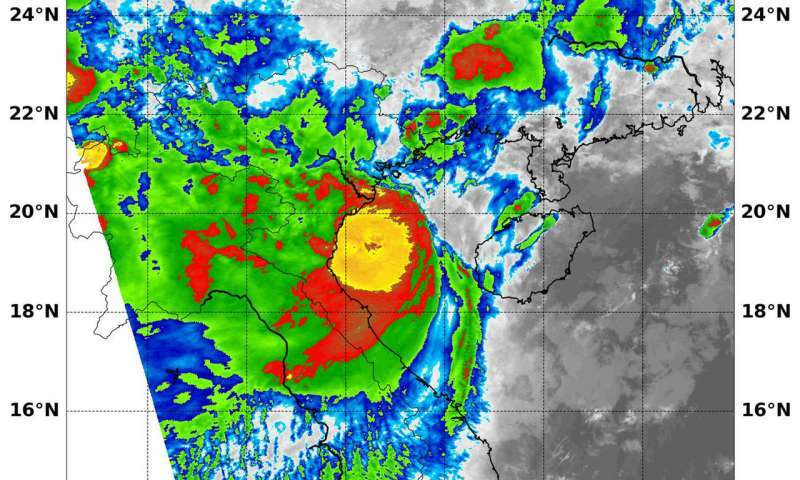 Tropical Storm Bebinca showed powerful, heavy rain-making thunderstorms on infrared satellite imagery when NASA's Terra satellite saw the storm along the northern Vietnam coast. The Vietnam Hydrological Administration (VHA) has issued a tropical storm warning for coastal Vietnam. Infrared light provides valuable temperature data to forecasters and cloud top temperatures give clues about highest, coldest, strongest storms within a tropical cyclone. On Aug. 16 10:45 a.m. EDT (1445 UTC) the Moderate Resolution Imaging Spectroradiometer or MODIS instrument aboard NASA's Terra satellite captured an infrared image of Tropical Storm Bebinca. MODIS found cloud top temperatures of strong thunderstorms around the center and just off-shore. Those cloud tops were as cold as or colder than minus 80 degrees Fahrenheit (minus 62.2 Celsius).NASA research has shown that cloud tops that cold can produce heavy rainfall. At 11 a.m. EDT (1500 UTC) on Aug. 16, Bebinca had maximum sustained winds near 69 mph (60 knots/111 kph). It was located near 20.0 degrees north latitude and 107.3 degrees east longitude. That's approximately 99 nautical miles southeast of Hanoi, Vietnam. Bebinca has tracked toward the west and is expected to continue in that direction though landfall. The Joint Typhoon Warning Center forecast calls for a landfall just south of Hanoi late on Aug. 16 or early on Aug. 17.